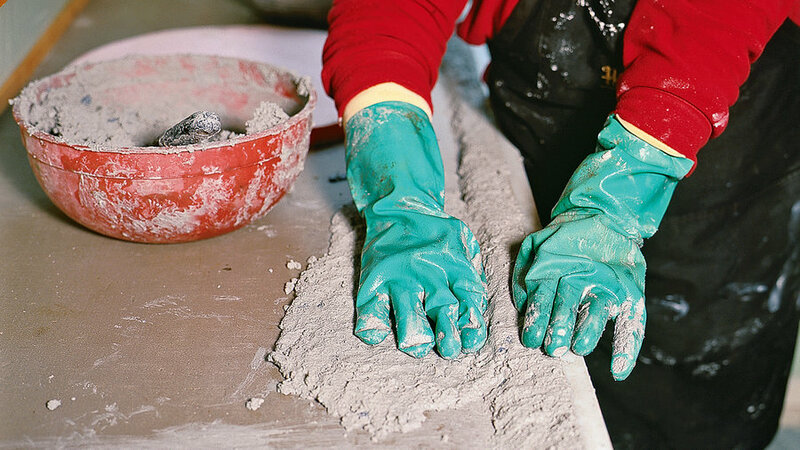 Casting a countertop in place lets you skip both the heavy lifting and the "upside down and backward" thinking involved in precasting into a mirror-image mold. But troweling the surface smooth does require skill. Practice on other projects first. 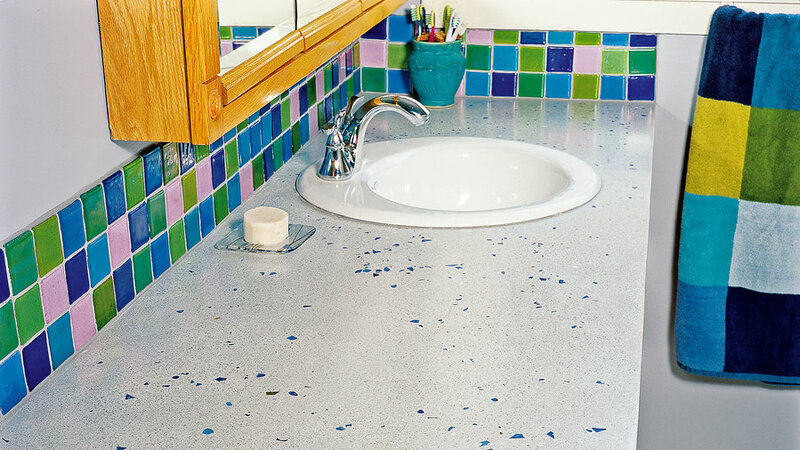 The countertop rests on a base of ½-inch-thick cement board, enabling you to keep the concrete 1 inch thick except at the edges, which are just deep enough to hide the cement board. The result is a normal-height countertop that's easily supported by standard cabinets. 1) Make a template by outlining the shape of your countertop on cardboard. The edges should be flush with the sides of the cabinet. If the counter is bigger than a sheet of cement board, mark joints on the template; they must be placed over cabinet walls. 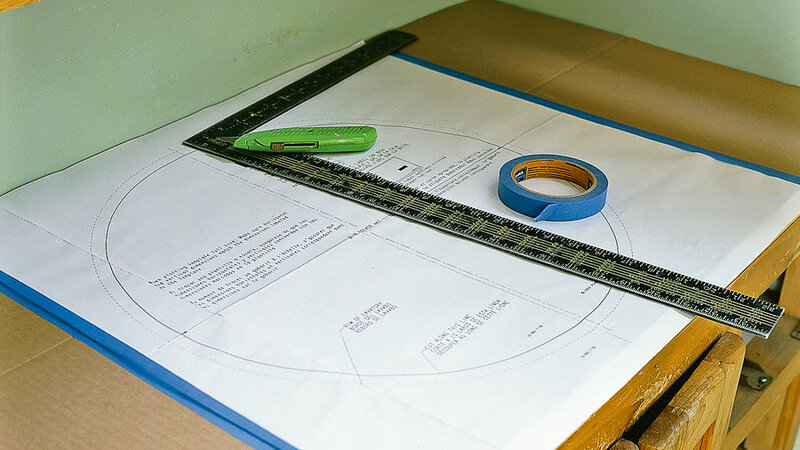 Also mark the sink outline using the template packaged with it. 2) Using the sink template as a guide, cut a plug from foam insulation at least 1 1/2 inches thick to keep the sink free of concrete. A jigsaw or bandsaw works well. Sand edges of the foam and wrap them with plastic tape. 3) Cut the cement board to fit. 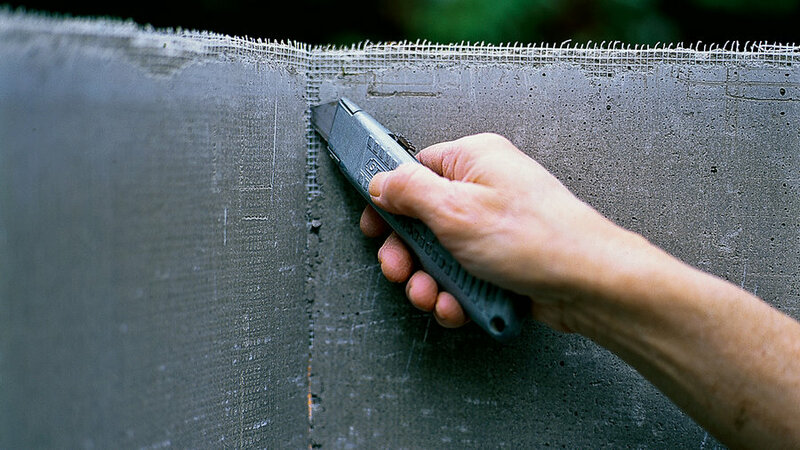 For straight cuts, score a line with a utility knife or a knife made for cement board. Snap the sides into a fold and cut through the board's interior mesh, as shown. 4) Cut curves with a jigsaw fitted with a wood blade. The blade will wear out fast; have a spare. 5) Along the top of the cabinet sides, screw on the scraps of wood flush with the cabinet top. Drape plastic over the cabinets and place the cement board on top. Then screw down through the board into the wood scraps using drywall screws. Attaching the board this way makes the counter easy to remove if you or a later owner wants to redecorate. Attach the foam plug in a similar way. 6) To guard against cracks appearing in the countertop, cover seams with the mesh tape sold for use with cement board. The tape has an adhesive backing, so it stays in place. 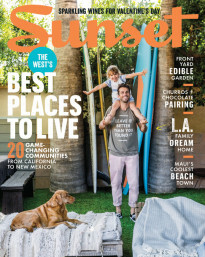 7) With aviator's snips, cut 2½-pound galvanized-steel stucco lath to match the countertop, minus a 1-inch gap along all edges, including all around the sink. If you need multiple pieces, overlap the mesh by a few inches. 8) Tack a board 1 inch thick along the back edge to create a guide when you screed the concrete. Plan to cover this later with a backsplash. 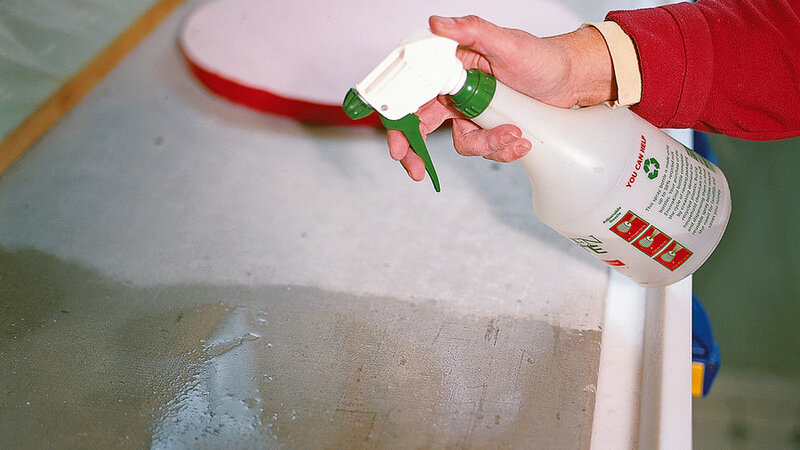 9) Before you mix the concrete, dampen the cement board with water. 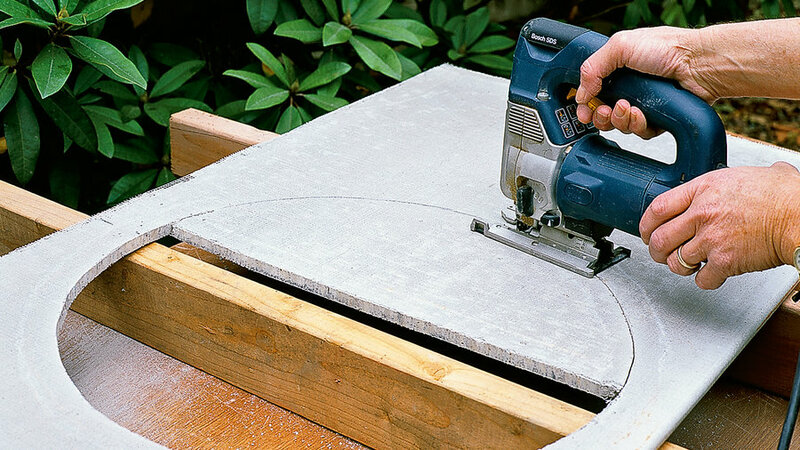 If the cement board dries out, repeat this step just before you fill the form. But blot up any puddles. 10) Prepare basic sand mix (1 part cement, 2 parts sand, approximately ½ part water) or a bagged sand mix. 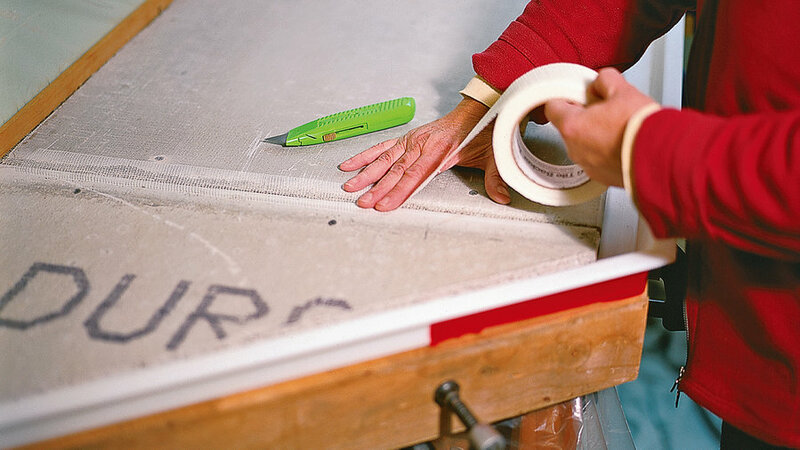 With a putty knife, take a little of the prepared mix and press it down into seams covered with mesh. By hand, pack more of the mixture into the edge form. Work quickly to fill the rest of the form halfway. 11) Place the wire mesh. With a float, lightly press it into the bottom layer, just enough so the wire doesn't curl. Make sure it isn't too close to the edges. Then fill the form the rest of the way. 12) With a hammer or stick, tap along the edge band to release air bubbles. Then level the concrete with a straight board as you would for any poured project. 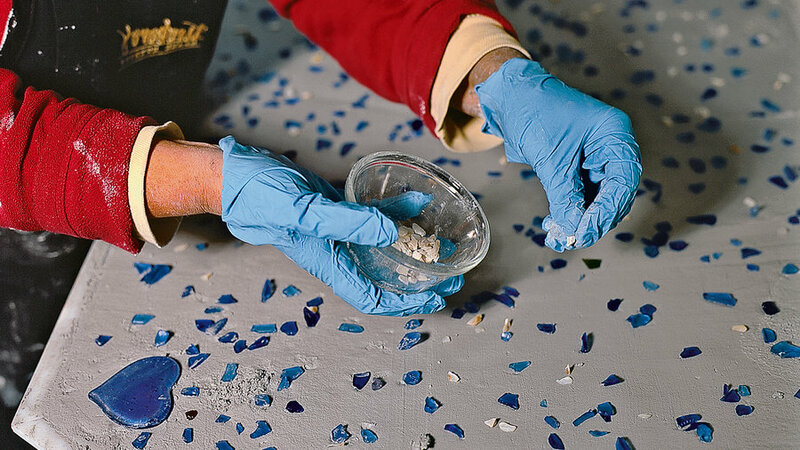 13) Sprinkle glass pieces, mother-of-pearl, or other inlays on the surface. 14) Embed the inlays by troweling over them. To eliminate gaps around their edges, trowel until they are completely covered with the cream of cement and fine sand that is on the surface. 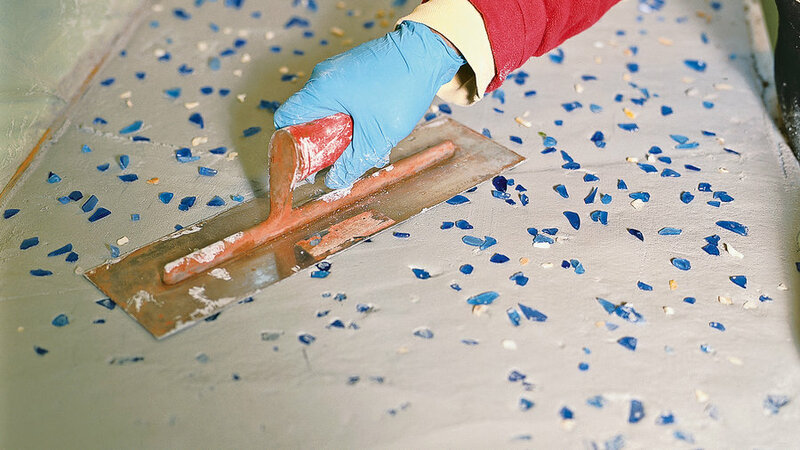 15) Cover the countertop with plastic. For the next three days, periodically mist the concrete to keep it damp. 16) Remove the edge form and cut out the sink plug. 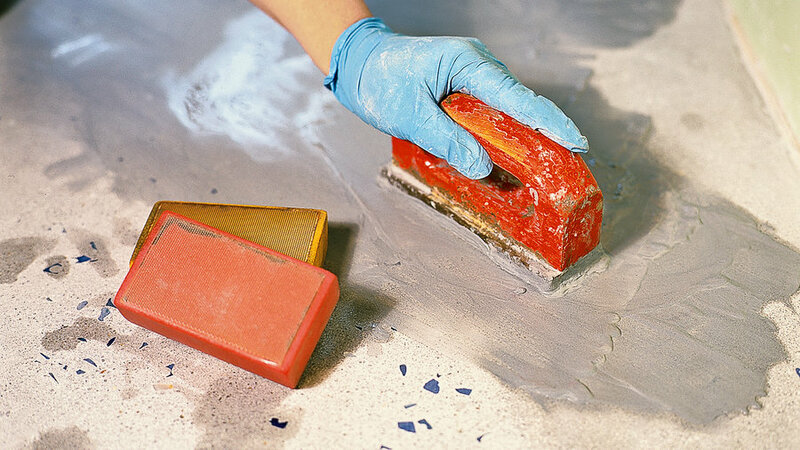 Then begin polishing with wet-dry sandpaper, diamond pads, or solid aluminum-carbide blocks. Start with 100- or 120-grit abrasive and work up to 220 and then 440. 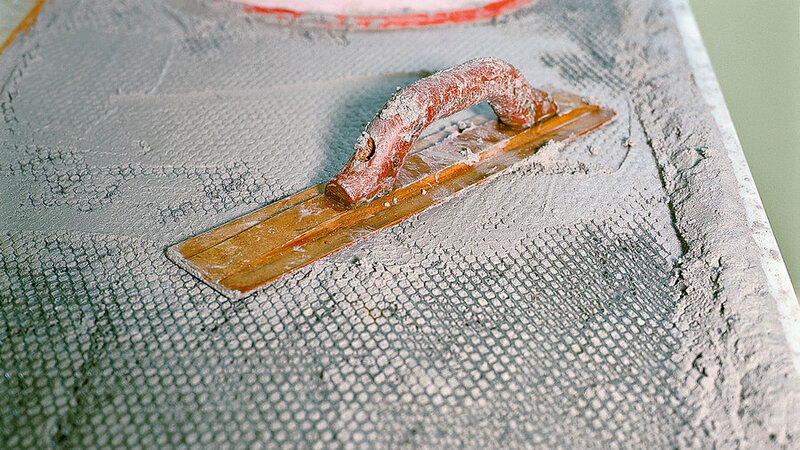 If sanding ejects whole pieces of sand or other aggregate, delay this step for another day. Keep handy a pan of water and a sponge (preferably the type sold for masonry jobs) so you can keep the surface damp and periodically wipe away the slurry you will create. Stop sanding when you like the effect. 17) If you see gaps that you don't like, fill them with a paste of cement and water. Allow them to harden for a few days. Polish with wet-dry sandpaper. 18) Seal and wax the counter before you use it.